Is there anything more ironic than the NME publishing a Cool List? Yet here it comes again, the useless stepchild of annual self-serving lists; and this year, boy, have the NME shoved their tongues into their cheeks and burrowed hard. Just look who makes the Top Ten Cool People: two blokes from Kasabian, some guy from 2010’s forgotten band Hurts, Oh-My-God-I-Never-Saw-This-Coming-At-All Lana del Rey, and, of course, Azealia Banks. If you’re also shrugging and mouthing the word “Who?” after reading the latter, fear not, as conveniently, she’s appearing on the forthcoming NME Tour. Does anyone actually fall for this stuff? 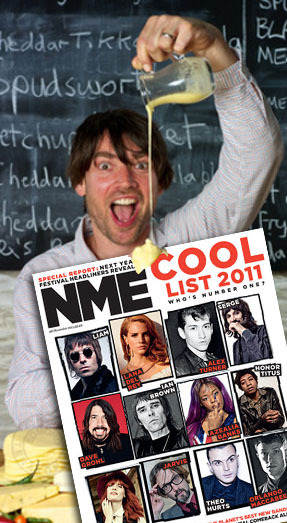 Alex James, who is so uncool now that he may well go full circle and appear on next year’s list, pour his cheese appropriately. SECOND! Reid’s been on ANBAD before, hasn’t he? But this is a remix, so he’s allowed on again. Phew. Controversy averted. And, guess what, it’s a typically punchy and frothy stripped-back and pulsating mix too. Another minor triumph. THIRD! What’s that? Coo Woo? Spazmoid surf-pop? Big, broad choruses? Yeah, why not. Interestingly, I’m told the band is from “Milwaukke, WI”, but the song itself is tagged with the phrases “Blackpool Amusements” and “Huddersfield”. Ooh, the glamour. FOURTH! Dark Arts are all noise, buzz and clatter, earnest middle-eights and abrupt guitar noises that devolve into unusually jaunty and creeped-out sound-chunks. GOOD. Posted on November 23, 2011 by Joe Sparrow. This entry was posted in Headline, Today's New Band. Bookmark the permalink.